Our Peppa Pig toilet training range has been designed so your child is comfortable and safe whilst at the same time feeling happy that they are sat with their favourite Disney character. This brightly coloured range has been proven to make a challenging experience much more fun and exciting. The design is practical too--it is lightweight and easily portable so you can take it with you on holiday as well as using it at home. This steady potty has been designed with characters from the popular TV series and features Princess Peppa Pig and friends, which is a great way to encourage your child to start toilet training. For extra stability the potty has been designed with a high back and also non-slip, steady feet. 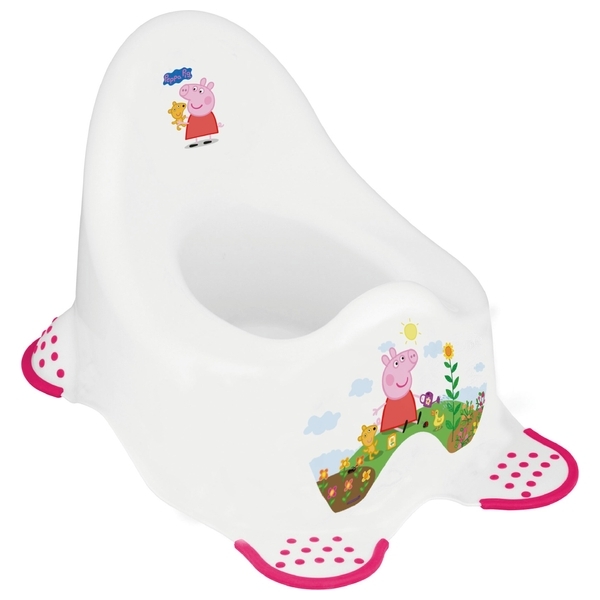 Part of the Peppa Pig toilet training range – this design is also available in a steady potty and step stool (each sold separately). EU Warning: Clean before and after every use with mild soap and a damp cloth. Always use with adult supervision. This product is not a toy. Never leave a child unattended. Inspect potty before each use.